A blessedly quick objective this one! 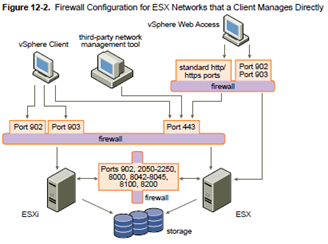 Quite why the ESXi Configuration Guide is listed in the blueprint is anyone’s idea as ESXi doesn’t contain a firewall! The blueprint also lists vicfg-firewall which is a typo – they mean esxcfg-firewall, as vicfg-firewall doesn’t exist! 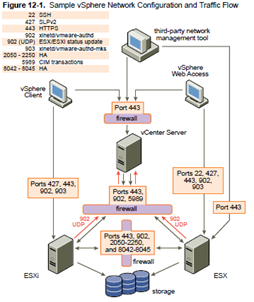 The ESX Configuration Guide talks very generally about where to put firewalls to protect traffic. In reality I can’t see much difference in architecture whether you have a vCenter server or not. 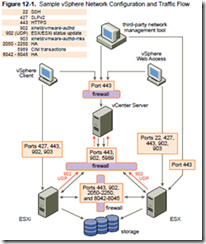 These two diagrams are from the ESX Configuration Guide – minimal differences! The firewall is ESX only (there’s no ESXi firewall as no service console). High (outbound blocked, limited inbound allowed (902, 443,22,123 and a few other including ICMP).